The primary market is a financial market where new securitiesPublic SecuritiesPublic securities, or marketable securities, are investments that are openly or easily traded in a market. These securities are either equity or debt-based. An equity security is an investment based on the equity of a company. A debt security is an investment based on the debt of a company or entity are issued and become available for trading by individuals and institutions. The trading activities of the capital marketsEquity Capital Market (ECM)The equity capital market consists of the primary and secondary market where stocks are traded. This market includes dealer and OTC markets. The equity capital market is a subset of the broader capital market, where financial institutions and companies interact to trade financial instruments and raise equity capital are separated into the primary market and secondary market. The primary market is a place where companies issue a new security that didn’t previously exist or trade on any exchange. A company offers securities to the general public to raise funds and fulfill its long-term goals. It can also be called the New Issue Market (NIM). In these markets, securities are directly issued by the companies to the investors. The ways securities are issued is either by an Initial Public Offer (IPO)Initial Public Offering (IPO)An Initial Public Offering (IPO) is the first sale of stocks issued by a company to the public. Prior to an IPO, a company is considered a private company, usually with a small number of investors (founders, friends, families, and business investors such as venture capitalists or angel investors). Learn what an IPO is or Further Public Offer (FPO). An IPO is a process by which a company makes a public offer for the very first time to the investors and ask them to invest in the shares of the company. Through an IPO, the company is able to raise funds and investors are able to invest in a company for the first time. The investors become the shareholders or owners of the company for that much share. Similarly, an FPO is a process by which already listed companies offer fresh equity in the company. Companies use FPO to raise additional funds from the general public. It is one of the most popular ways to issue securities to the general public. Through an IPO, the company is able to raise funds, and the securities are listed on the stock exchange for trading purposes. At a time when a company decides to raise more capital from existing shareholders, it offers the shareholders more shares at a discounted rate than the prevailing market price. The number of shares offered is on pro-rata basis, and this process is known as a Rights IssueRights IssueA rights issue is an offering of rights to the existing shareholders of a company that gives them an opportunity to buy additional shares directly from the company at a discounted price rather than buying from the secondary market. The number of additional shares that can be bought depends on the current ownership of. When a listed company issues shares to a few individuals at a price that may or may not be related to the market price, it is termed as a preferential allotment. The company decides the basis of allotment and is not dependent on any mechanism such as pro-rata or anything else. 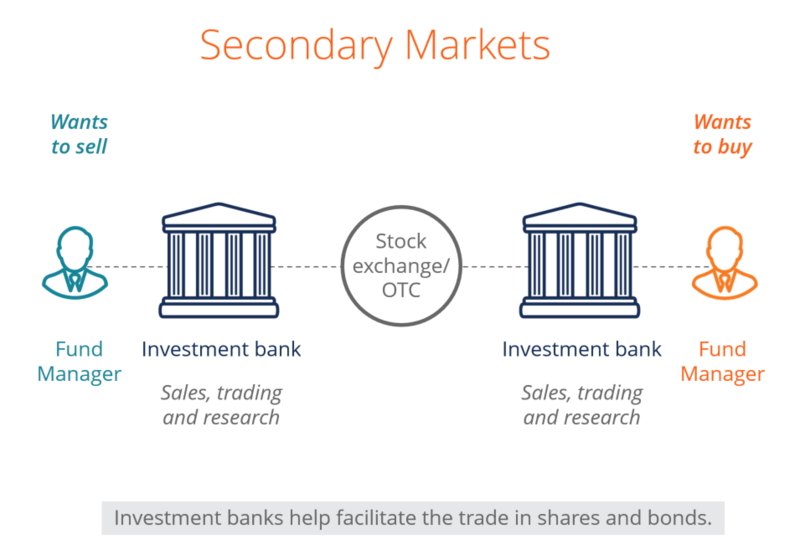 The secondary market is a place where existing shares, debentures, bonds, etc. are traded among investors. 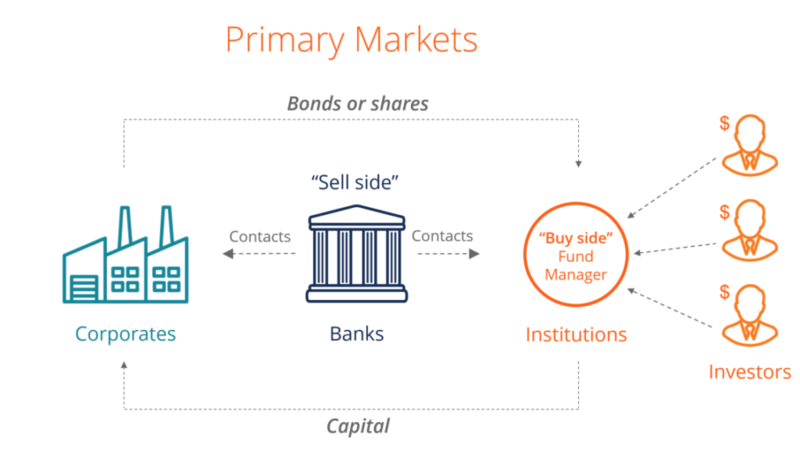 The securities that are offered first in the primary market are then traded between each other on the secondary market. The trade is carried out between a buyer and a seller with the stock exchange facilitating the same. In this process, the issuing company is not involved in any way. It is a way of issuing fresh shares in the market. It is also called New Issue Market. A major component of the primary market is the IPO. It is a place where already issued or existing shares are traded. It is called After Issue Market. The amount received from the issue of shares goes to the company for their business expansion purposes. The amount invested by the buyer of shares goes to the seller, and hence the company doesn’t receive anything. Securities are issued by the companies to the investors. Securities are exchanged between buyers and sellers, and stock exchanges facilitates the trade. The securities are all issued at one price for all investors participating in the offering. Securities are exchanged at the market price. The primary market doesn’t provide liquidity for the stock. The secondary market provides liquidity to the stock. Underwriters act as intermediaries. Brokers act as intermediaries. On the primary market, security can be sold just once. On the secondary market, securities can be sold innumerable times.